Rainbow is different, and we believe it is important to choose the service you want, where and when you want to receive it and who you would like to provide it. We offer a high quality, flexible and aspirational service, always keeping our key values close to heart. 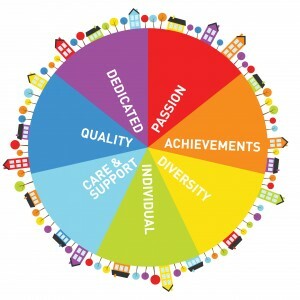 We deliver care of only the highest quality, ensuring each service user is safe and happy. We have ISO 9001 Quality Assurance system in place which is audited yearly. All members of staff are recruited as per the Care Inspectorate guidelines – each with 2 references, a PVG scheme membership, 3 days induction training and at least 20 hours shadowing in the community with a senior member of staff. We have the experience and expertise to help in any way we can, 24 hours, 7 days a week – no request is too small or large. We appreciate that each and every one of our service users are unique, and ensure that you are treated with acceptance and respect in a safe, positive, nurturing environment.